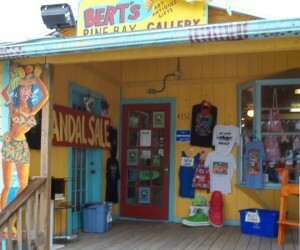 Bert’s Pine Bay Gallery is a Matlacha landmark. Nestled at the northeast foot of the Matlacha Bridge, it affords guests not only an array of delightful artistic treasures and novelties, but a commanding view of the placid waters of Matlacha Pass. Many of the gallery’s visitors pause on its back porch for a moment’s reflection as they drink in the vista of tranquil waters, reflected cloud-scudded sky and masted shrimp boats that still ply the depths in search of catches eagerly snapped up by local restaurants and fish houses. Location. Gallery row in Matlacha straddles SW Pine Island Road, the main thoroughfare that connects the island to the mainland. While other galleries are located west of Matlacha Bridge, Bert’s Pine Bay Gallery greets visitors as they first enter the heart of the town. 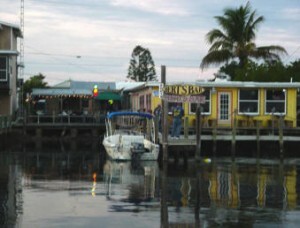 The gallery is across the street from Bert’s Bar & Grill (right), a mainstay of the Matlacha community since the 1930s, and The Bridgewater Inn, which is built on a dock that juts into Pine Island Sound. Facilities. 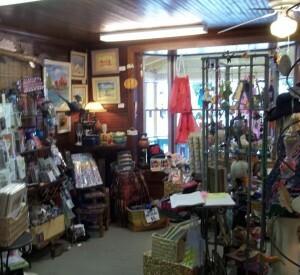 The gallery is housed in a charming banana-colored clapboard cottage trimmed in cerulean blue. Four rust red steps lead to a weathered wood front porch and a pane-glass red door. Inside, visitors are surprised to find a deceptively large space that is divided into half a dozen cozy rooms crammed “to the gills” with hand-crafted jewelry, painted glassware, painted furniture and a host of other merchandise (see below). 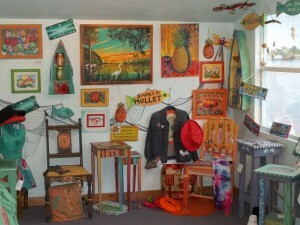 The sun room in the back is devoted to one of the gallery’s leading ladies, multi-talented Pine Island resident Mel Meo. 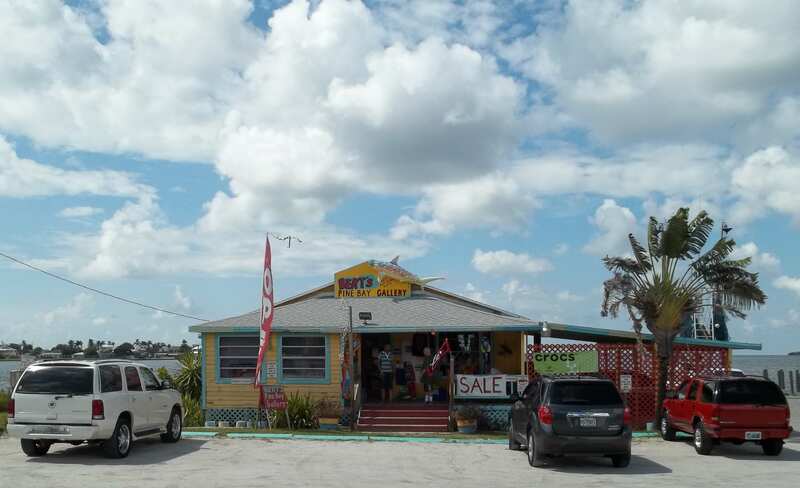 It is also an ideal space in which to pause and drink in the broad expanse of water and sky that Bert’s shares with the shrimpers moored right next door. Gaze long enough and you just might see porpoise fins slicing through the tranquil water or pods of manatees lumbering lazily by. 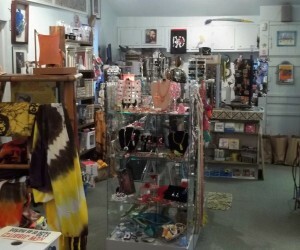 With walls, floors and displays packed with unique and intriguing gift ideas, souvenirs and novelties made by dozens of Matlacha and Pine Island artists, artisans and crafts people, the gallery is in reality primarily a gift shop with numerous artistic gems peeking out from open spaces amid the gallery’s other merchandise. 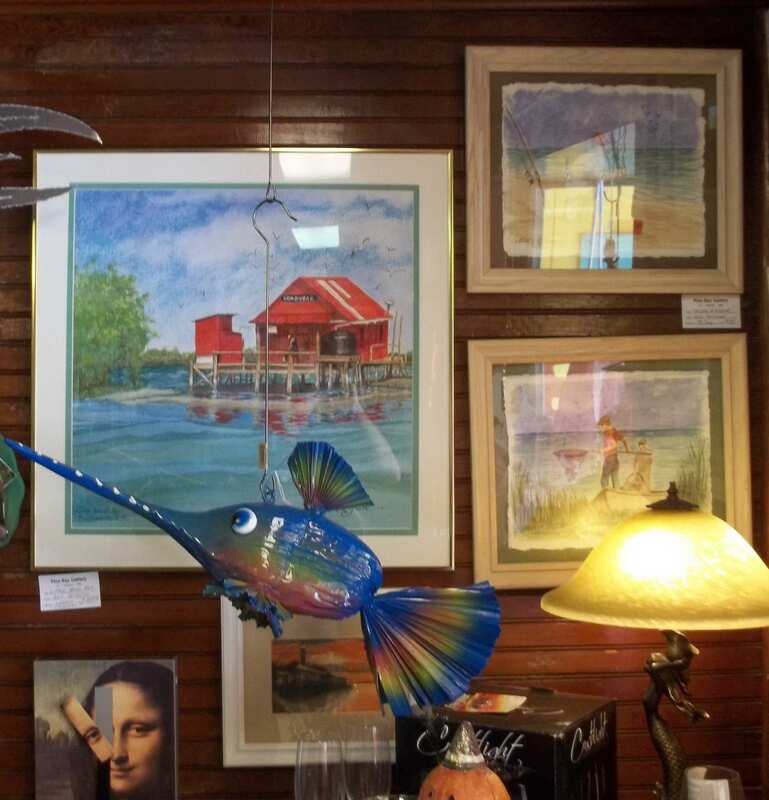 In fact, the Best of Pine Island officially recognized this emphasis when it named Bert’s Pine Island Gallery earlier this year as Pine Island’s Best Gift Shop in 2011. Cahill possesses an abiding love of the coastal community she now calls home. “The residents out here want to keep the look and feel, but it’s changing so much,” Cahill frets. “So I decided to use my art to catalog and record the area for posterity. All all the little buildings you see driving in on Pine Island Road. 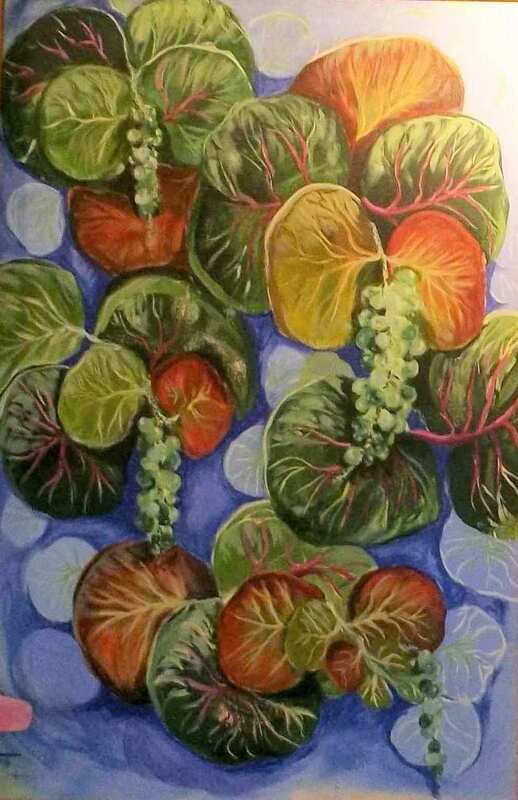 In my paintings, I’m recording what Matlacha is right now.” Visit Matlacha, and you’ll see why it inspires both Cahill and Mel Meo. “The scenery, the birds, the palms, says the artist. “It’s all so beautiful.” That’s why she feels compelled to capture it all right now … in case it does change in spite of the coastal community’s efforts to preserve its small, fishing town charm. Nell McGuire. This local watercolorist credits the slick pin-up calendar art of George Petty (famous for his Memphis Belle logo), the storytelling of Norman Rockwell and the treatment of light and color by Johannes Vermeer as early influences. 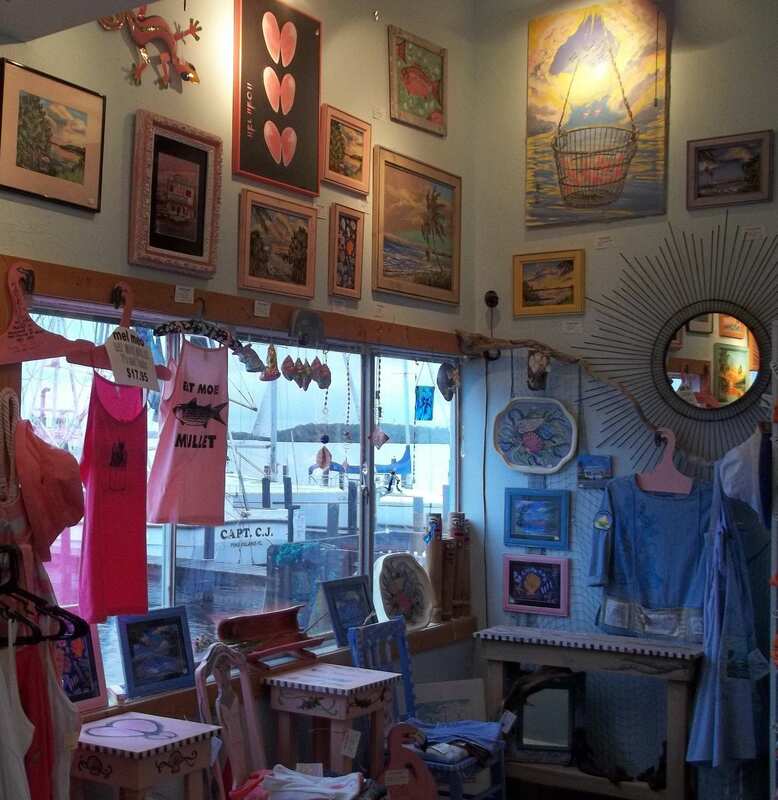 As evident from her compositions, Nell finds continual inspiration in the local motifs found in and around Matlacha, Pine Island and Bokeelia. An Ohio transplant, Nell has been soaking up the local culture since 1972. 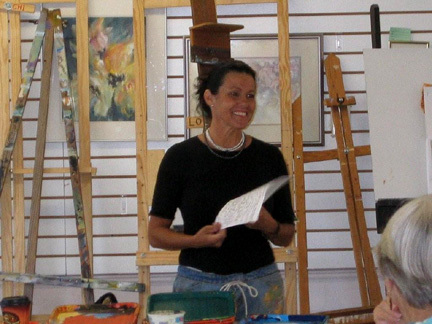 Incredibly, she only began painting professionally in 2000, but her works evince a maturity and sensibility well beyond her decade of purposeful experience. 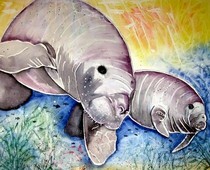 She has been exhibited widely throughout southwest Florida and her Bait, Beer or Taxes won Best of Show in the 2007 Winner’s Circle Exhibition of the Art Council of Southwest Florida in Naples. Lynne Reinas. Like many on the island, Lynne Reinas did not start painting until she retired. But her love of art dates back to her eighth birthday, when her uncle gave her an ink set and cartoon book. Today, Reinas is making up for lost time. After a 10-year stint teaching ceramics, she is now creating conservation-minded representational work in acrylic, watercolor, pen and ink and colored pencils. She often embeds words like conserve, preserve and protect or peace, love, hope and joy in her compositions, a technique borrowed from magical realism, which describes paintings that tap into viewers’ emotional reservoirs by burying unsuspected or suggestive content into what might otherwise seem like ordinary motifs. Not surprisingly, Reinas credits Andrew Wyeth, a leading proponent of magical realism, and Norman Rockwell as inspirations. Clearly, however, her acrylics and watercolors bear the mark of John James Audubon as beacons that draw attention to threatened and endangered species. While there is a modicum of her wall art in the gallery, visitors will find a cornucopia of Reinas’ hand-crafted art jewelry. 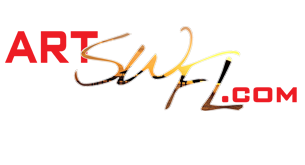 Other Products and Services. 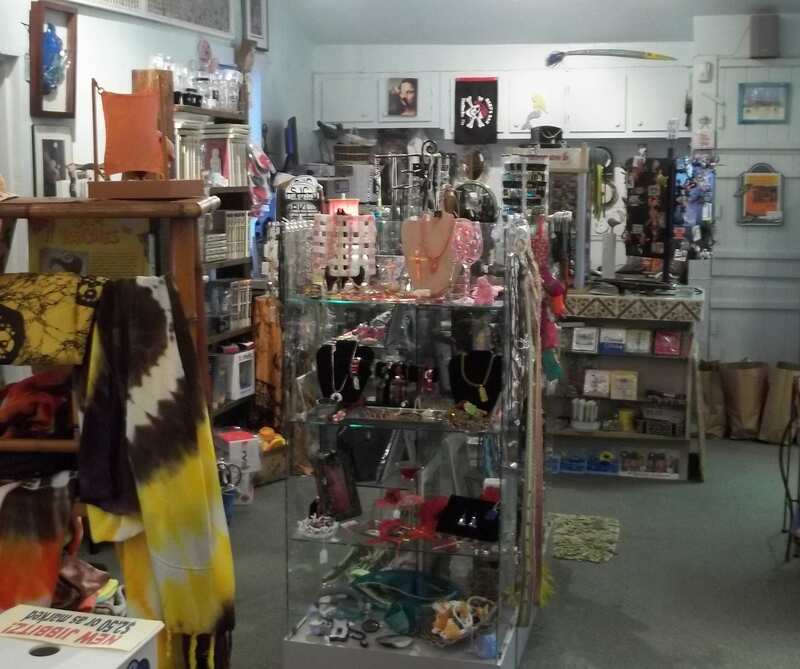 In addition to fine art, the gallery offers locally crafted art jewelry, painted glassware, shells, antiques, home decor items, books, cards, music CDs featuring local artists, hats, sunglasses, tie-dyed and hand-painted clothing, tablecloths and towels. One room is devoted exclusively to Crocs (the popular footwear that’s all the rage right now), and another to and tie-dyed shirts and ballcaps, but there are many quality paintings and collages for the serious art lover or collector to find. Hours. The gallery is open from 10 a.m. to 5 p.m. on Monday and Tuesday, from 10 a.m. to 7 p.m. Wednesday through Saturday, and on Sunday, the gallery is open from noon to 5 p.m.
Telephone Number and Website. You can reach the gallery by telephone at 239-283-1335 and online at http://www.bertsgallery.com. The gallery does not have either a Facebook or Twitter presence at this time. Gallery Director. The gallery is managed by Deb Cole, center, shown accepting award for Pine Island’s Best Gift Shop in 2011 with husband, Newt. Exhibitions. The gallery has not yet released its 2011-2012 exhibition schedule.